From the creators of Wallace and Gromit This is the complete collection of all 40 sheeptacular episodes from Series One! Join mischievous Shaun and the rest of the flock for mayhem in the meadow, chaos in the countryside and pandemonium in the pasture,as Shaun and his friends try to pull the wool over the eyes of the farmer’s trusty sheepdog Bizter! Shaun is a sheep that isn’t a follower of the flock, rather a rebel who leads them into all kinds of bother and mishap. 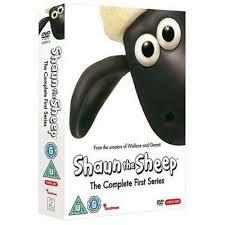 This compilation includes all the episodes from Shaun's first series.